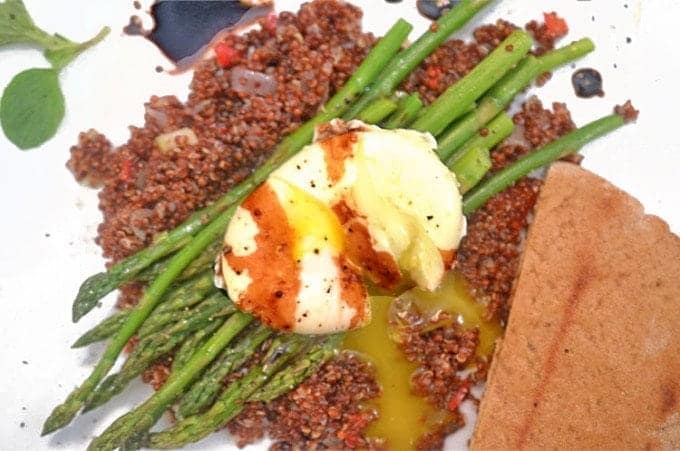 Nothing says renewed spring and taste quite like Asparagus and Eggs, find this at the intersection of health and beauty. In our kitchen and subsequently on our dinner plates, we’ve been trying a few new things over the past year. Since officially launching platter talk we have introduce ourselves to a few culinary techniques, foods, and ingredients that are new to us and by the same token, we hope to have introduced some that are new to you, our reader. By now, almost everyone has heard about quinoa, the ancient Peruvian grain that produces edible seeds, replete with protein and lacking gluten. 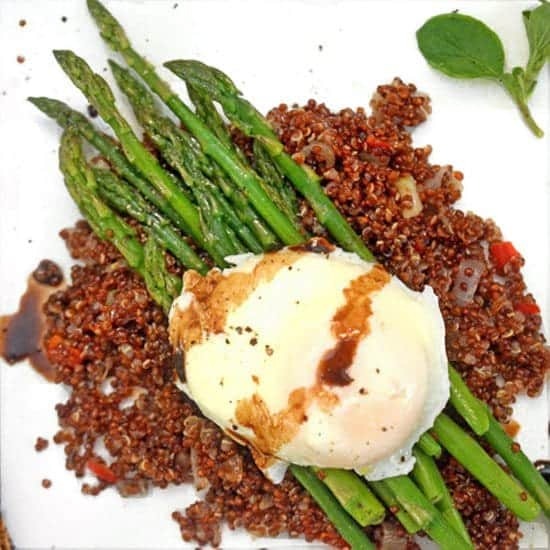 Over the last several years, quinoa has become a favorite food of health enthusiast, being touted as an all natural super-food, and with it’s popularity has come a constant flow of new uses and idea for quinoa. We’ve featured it a few times here on platter talk, with some stuffed cherry tomatoes, where we mixed it with some goat cheese, with a delicious and colorful salad featuring butternut squash and roasted red peppers, and we even showed you a quick technique for rinsing the uncooked seeds to help wash away the inherent inherent of its natural state. Today we are adding one more meal idea to our collection of quinoa dishes. 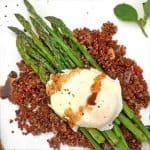 The fresh asparagus and poached egg add color, taste, and nutrition to the mix. 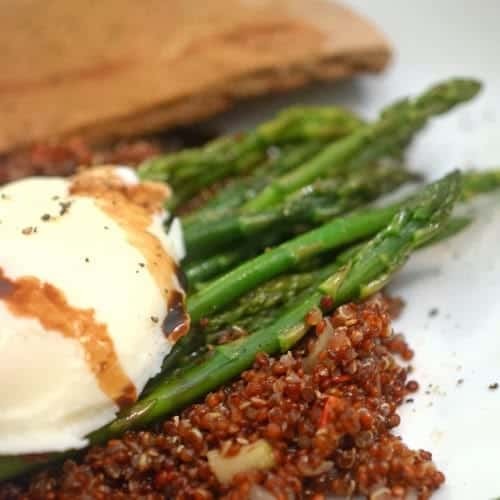 Taking it an even higher level of sensation, we crisped up the underlying bed of quinoa, adding more texture and crunch to an already sensational entree. For a crowning touch, we drizzled a swirl of lemon-balsamic reduction over it all, tying the whole package together for an easily attainable meal that indulges your body and your soul. 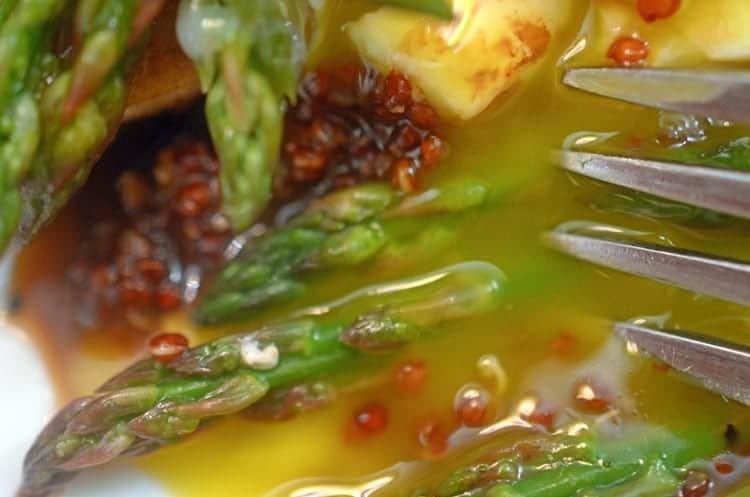 This Asparagus and Eggs combination is sure to please the eyes the palate, and your health. Using small sauce pan, combine broth and quinoa over medium heat. Cover and bring to boil, then reduce heat to simmer and cook for about 12 minutes. 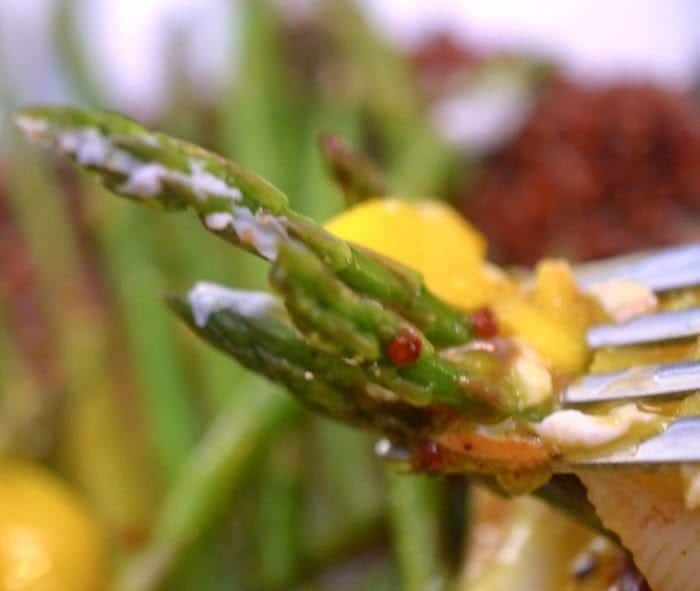 Wash and stem asparagus and set aside. Heat and prepare water in pan to poach eggs. In small sauce pan, combine balsamic vinegar and lemon juice and heat over medium heat. Reduce to about 2 tablespoons, about 7 to 10 minutes. Add shallots and chili pepper to pan and stir. Drain cooked quinoa and reserve sauce pan. Add half of quinoa to pan containing shallot and chili pepper, stir for a minute and then add remaining quinoa. Stir over high heat to crisp the quinoa and then return entire mixture to small sauce pan, cover and set aside. Reserve saute pan. 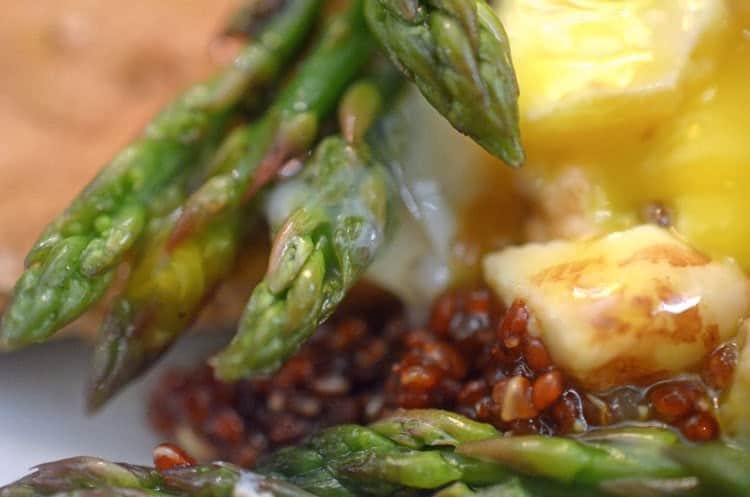 Add asparagus to reserved saute pan and stir over medium heat, util bright and al dente, firm to the bite. Set aside and loosely cover. 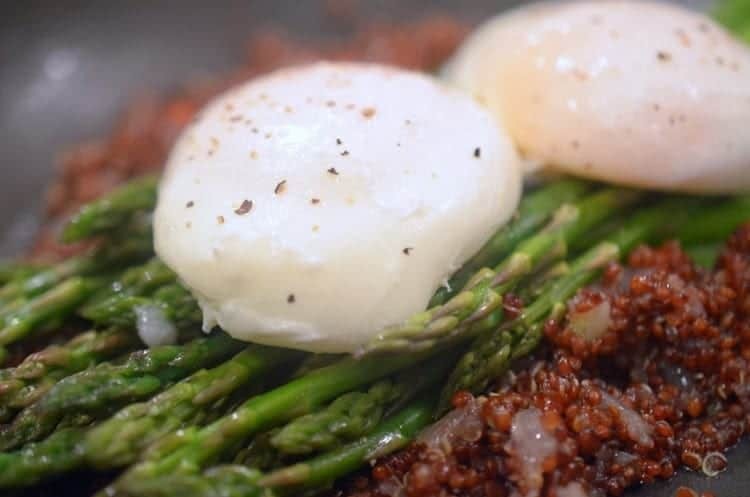 Poach eggs in prepare water. 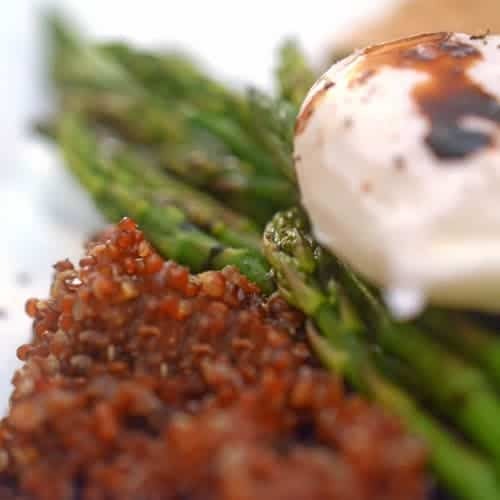 Plate quinoa, asparagus and poached egg(s). Drizzle with balsamic vinegar and serve immediately. 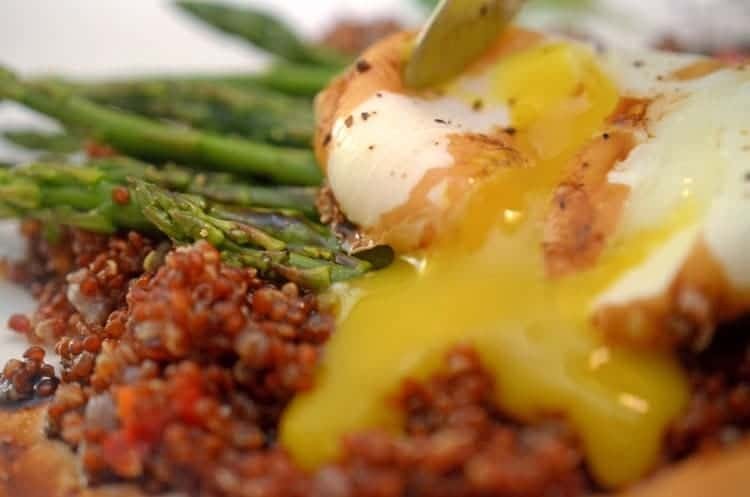 If you are looking to cut calories, decrease the amount of quinoa in this recipe by half. It will reduce the calorie count of this recipe by about 170 calories, per serving. That is something I always dream to make and end up making porridge for kids! Such a great click!